A community of practitioners in Medell�n, Colombia, is working for peace and reconciliation in a deeply troubled country. Here they describe their wide-ranging and dedicated practice. Monta�a de Silencio (“Mountain of Silence” in English) is a community of Buddhist practitioners inspired by the Soto Zen tradition, and also by the Theravada teachings transmitted through the Insight movement that has taken place in the United States in the last few decades. We are located in the city of Medell�n, Colombia. We started practicing in 1989 under the direction of the French Soto Zen monk Reitai Lemort, Taisen Deshimaru�s disciple. In 2011 we separated from our former leader in an effort to provide a practice that was oriented towards open and socially engaged lay people. We have always felt a deep resonance with Suzuki Roshi�s teachings, so we approached San Francisco Zen Center. We also reached out to the Insight Meditation Center led by Gil Fronsdal in Redwood City, California. Both communities have been our main sources of inspiration and support for the past five years. Our practice place is in the apartment where Sanriki Felipe Jaramillo and Seigen Catalina Acosta live. We have regular zazen periods three times per week and a weekly mindfulness group in this apartment. It�s interesting and challenging to have the zendo in our apartment as we try to integrate the sangha schedule with daily family dynamics. It has been a beautiful way to learn how to adapt our life to practice instead of trying to adapt the practice to our life. Today we�re in the process of finding a new place because the small zendo is no longer spacious enough to accommodate all the practitioners. We are exploring what it means to practice in community and, in doing so, we are better understanding the dedication and work it takes to make a community. The commitment to the practice of giving and receiving is a foundational teaching for us, so we try to maintain our activities as free of charge as we can. Our sangha is composed of single people, couples and families; there are even a few retired people and young students! The people in our sangha travel from all parts of Medell�n to sit zazen in the evenings, including a few who live across the city and brave the heat and the at times hectic city to practice. Our small but versatile zendo also serves as a sewing room. 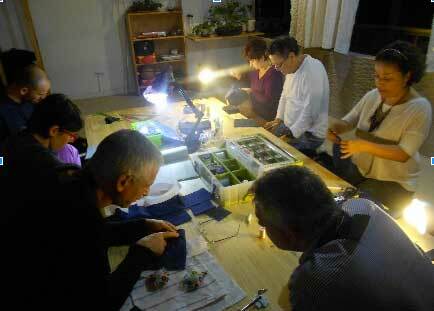 It has become the site for our weekly sewing practice. In the sewing room we made 13 rakusus that will be offered during our first jukai ceremony, scheduled for September of 2016 in our zendo. The sewing room is also a place where zafus and zabutons are made by hand while ancient Zen and Theravada stories are listened to ardently by eager ears. In 2014 we rented a rural property, above, to host retreats and practice sessions. The property has two rustic houses made of wood and stone, and is located on a nature reserve in the mountains near Medell�n, in a cloud forest ecosystem. It is currently in the process of becoming a natural sanctuary. We named the property Mu-Shin Hermitage. One of our sangha members, Juan Pablo, renounced the urban lifestyle to become the guardian of Mu-Shin Hermitage. He is able to live there because the community supports him entirely out of dana. In 2014 we initiated a project to accompany teenage victims of the Colombian armed conflict by supporting them in their process of social reintegration. We initiated this project wanting to adhere to our bodhisattva vows. The teenagers live in a reintegration house where we offer an optional mindfulness meditation program. In this weekly program, the teens who are interested in practicing gather as we share teachings and reflections about Buddhist ethics and values. We also host a movie club every other Friday evening where we watch films and discuss afterwards how they make us feel. Additionally, we offer a few silent nature retreats and practice sessions for the teens throughout the year. We would like to learn how to listen to them better, and become good spiritual friends for them. By accompanying the teens in their journey of reintegration, we are able to provide a service to our country and, in the process, learn and receive so much wisdom and knowledge from the teens. 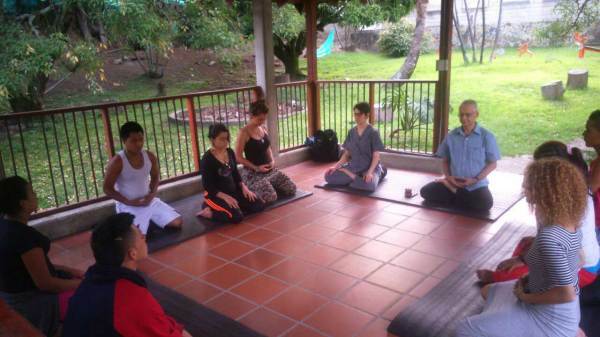 In 2015 we started a class of Buddhist teachings on Saturday mornings led by Sanriki Felipe Jaramillo. 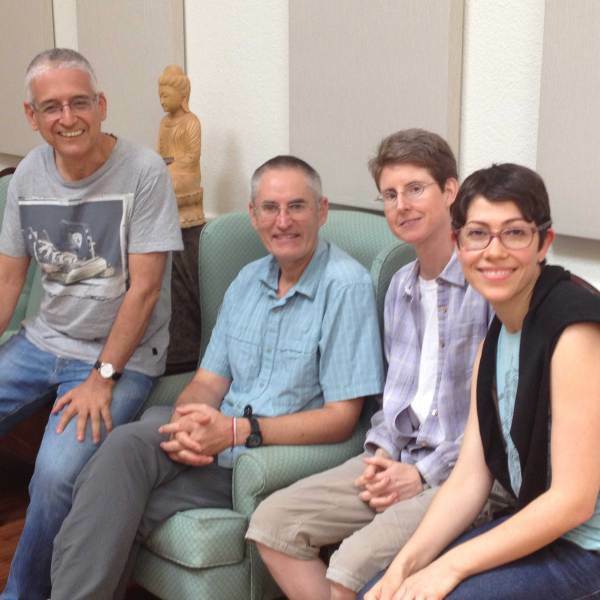 In Colombia there are limited contexts to study the dharma, so this study group has became a very important space for our sangha. Some historic aspects and more academic contents have been included this year, but there is also space for personal reflection and group discussions about Buddha�s teachings and how they are useful for us on a daily basis. 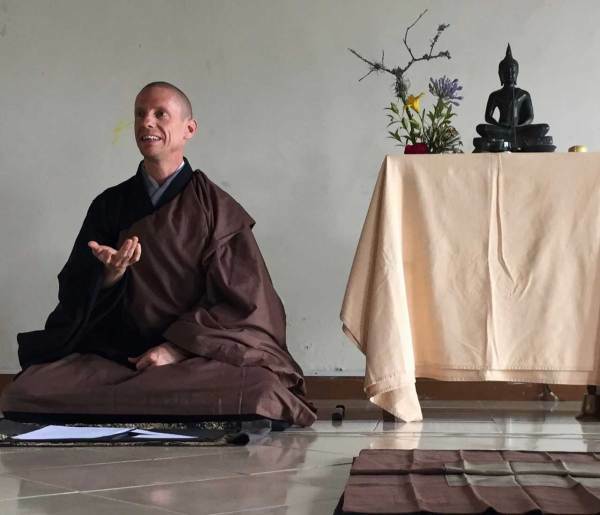 In March of 2016 Jiryu Rutschman-Byler from SFZC visited Medell�n to lead a sesshin and a few other activities with us. His visit was very important for our community. We found it touching and it left us in love with the gentleness and beauty of American Zen. Jiryu, below, has become our first SFZC mentor and he is guiding our path of transformation to become a part of the Branching Streams family. We have found in Jiryu a kind and open human being with a deep knowledge of the Soto Zen tradition. It�s a privilege for us to rely on a teacher like him. In the fall of 2016 Jiryu will offer the jukai ceremony where 13 new bodhisattvas will receive the precepts. Meanwhile, our senior practitioner and leader Sanriki Jaramillo is going to participate in the 2016 Fall practice period at Tassajara Zen Mountain Center as part of the training process that aims to ordain him in Suzuki Roshi�s tradition. Two years ago we became part of the extended Insight Meditation Center family. Gil Fronsdal, Andrea Castillo, Diana Clark, Chris Clifford, Kim Allen and other IMC members and teachers have become our mentors and family despite residing in California. Seigen Catalina received the precepts from Gil at Insight Retreat Center in 2015 and has been participating in a few training programs offered by IMC since. We are grateful to Gil and everyone at IMC for granting us the ability to offer a weekly mindfulness sitting group, thanks to their mentorship. 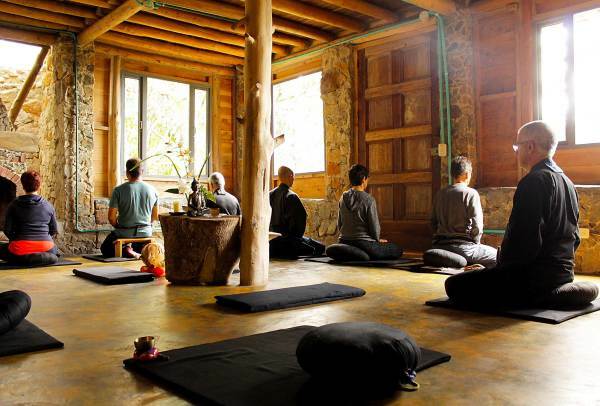 Monta�a de Silencio Comunidad Zen Insight has a deep and strong commitment to setting up spaces for the practice and study of the Buddha Dharma in Medell�n and in other parts of Colombia because our country needs a culture of peace, tolerance and wisdom.